There is something to love about every season in Adams County, Pa., but when it comes to stunning views, springtime holds a special place. Adams County is the number one apple producing county in Pennsylvania, meaning we have a lot of trees here. Orchards cover tens of thousands of acres in the county, where not only apples are grown, but peaches, pears, cherries, plums and a variety of other fruits as well. When spring rolls around, all of those fruit trees produce vibrant blossoms, creating a spectacle of color among the rolling hills of the countryside. For photography enthusiasts, nature lovers or even for those who just enjoy beautiful scenery, bloom time in the spring in Adams County is a sight not to be missed. We’ve rounded up the top ten places to catch breathtaking views of springtime blossoms in Adams County. Hollabaugh Bros., Inc. Fruit Farm & Market is tucked into the rolling hills of Adams County and has brilliant views of orchards in bloom from all sides. Be sure to stop in the market for fresh produce or a treat from their in-house scratch bakery – we recommend trying their signature Apple Cider Donuts. Appropriately named, Orchard Lane is brimming with impressive orchard views that will be in full bloom in the springtime. From Hollabaugh Bros. Fruit Farm & Market, head north on PA-34 for one mile. Make a right turn onto Orchard Lane, and enjoy the views. From Gettysburg, the journey to Boyer Nurseries & Orchards is just as gorgeous as the destination. Once you take in the encompassing blossom views, stop by Boyer Cellars, a premiere wine and hard cider tasting room featuring drinks from Great Shoals Winery. The Historic Round Barn & Farm Market, one of only a handful of round barns still in existence today, is home to some wonderful views of Adams County orchards. After taking in the sites and a trip into the market, head just up the road to Jack’s Hard Cider for a view of the same blossoms from a higher vantage point. Take Route 30 west out of Gettysburg for 12 miles, then turn right onto Buchanan Valley Road (Route 234). 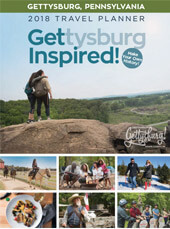 This is part of Destination Gettysburg’s Scenic Valley Tour for good reason – it goes right through the heart of the countryside, with incredible views of miles of orchards. For a pit stop, try Reid’s Orchard and Winery, located right on Buchanan Valley Road. Located only a half mile from the South Mountain Fairgrounds, the site of the National Apple Harvest Festival, McDannell’s Fruit Farm & Market boasts striking views of the surrounding orchards. Be sure to stop in the market to check out what fresh, seasonal produce is available. Quaker Valley Road is one of those off-the-beaten-path, countryside roads that locals use to check out some of the best orchard views. After leaving McDannell’s Fruit Farm & Market, head northeast on Brysonia Road for ¾ mile, then bear right onto Quaker Valley Road. Enjoy some of Adams County’s best views for 3.5 miles, until you come to PA-34, where you can turn right to head south back to Gettysburg. Peters Orchards is located at the northern most point of Adams County. There will be boundless blossom views on the drive through the county. Once you arrive, you’ll witness unforgettable views of the surrounding orchards. The site where Abraham Lincoln gave his famous Gettysburg Address is also the home to many remarkable springtime blossoms. A visit to Soldiers’ National Cemetery always brings a sense of peace, but especially so among when everything is in bloom. The Gettysburg National Military Park Peach Orchard became a site for battle during the Battle of Gettysburg in 1863. Although replanted several times since then, the site today remains a peach orchard, maintained by the National Park Service. Visitors today can enjoy the vibrant blossoms on the historic, hallowed ground. We would love to hear from you! Where do you enjoy taking in the beautiful springtime blossoms in Adams County? Share your comments below and share your blossom pictures with us on Facebook, Twitter and Instagram with the hashtag #GettysburgInspired. Here is my question. WHEN (approximately) do the apple blossoms bloom ?? We travel frequently to the Gettysburg area and always miss them. Realize weather is a factor. Any help you can offer on WHEN would be greatly appreciated. Thank you! It really varies from year to year. This year, things are blooming a little later than usual. Our apricot blossoms are currently in full bloom, and our apple blossoms are on their way there. We predict that they will be in full bloom within the next week or two. When will the Redbuds bloom this year, 2019. If we had to guess at this point, we are probably a month out yet. Stay tuned! Christopher – the annual reenactment will be taking place July 5-7 in 2019. Here is a link for more info on all the reenactment programs and event: https://www.destinationgettysburg.com/members/annual-gettysburg-civil-war-battle-reenactment.asp.